US food firm Hillshire Brands has said it is buying rival company Pinnacle Foods for a deal worth $6.6bn (￡4bn). 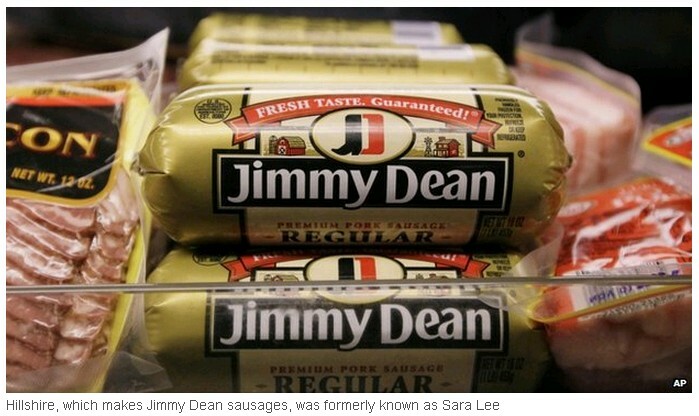 Hillshire's brands include Jimmy Dean, Ball Park and Sara Lee, while Pinnacle is known for Aunt Jemima and Duncan Hines. The combined company, which will be based in Chicago, is expected to generate $6.6bn in annual sales. Following the news, shares in both companies were up on the New York Stock Exchange in pre-market trading. In a statement, Hillshire said it would acquire all outstanding shares of Pinnacle Foods in a cash and shares transaction. "The acquisition creates a leading branded food company with enhanced scale, reach, and capabilities, while providing margin expansion," said president and chief executive of Hillshire Brands, Sean Connolly. Mr Connolly will run the combined company, which will retain the Hillshire name. Pinnacle's chief executive, Bob Gamgort, said the deal "speaks to the value Pinnacle employees have created". He added that the new firm would have a "broad reach across frozen, refrigerated and grocery categories". Pinnacle shareholders will receive $18 for each share held, plus half a share in Hillshire. They will own approximately 33% of the combined company. Although both companies' boards unanimously approved the merger, it is subject to regulatory and shareholder approval.